Gerald “Dusty” Thomas Taylor, 69, of Sanford, died Wednesday morning, March 27, 2019 at the MidMichigan Medical Center. He was born March 30, 1949 in Mt. Pleasant, son of the late Russell(Burl) Taylor and Helen (Ed) Hubble. Dusty worked for many years in the the oil fields as an operator and driller. He was also employed by Brandle Roofing until his retirement. He married Cora Lynn Warner on September 28, 1975 in Breckenridge, she preceded him in death in 1996. He enjoyed dancing every chance he could, playing cards, fishing and hunting. His true passion was spending time with his family, especially his grandchildren. Dusty is survived by his children, John (Bobbi Jo Napp) Taylor, Tim (Lisa) Brown and Kelvin Taylor; 6 grandchildren and 12 great grandchildren. He his also survived by sisters Shelly Taylor and Kelly Taylor. In addition to his wife and parents, he was preceded in death by his brother Russell and sister Marsha. 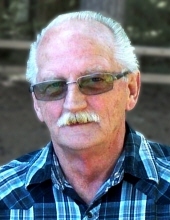 A memorial service for Dusty will take place at Thursday 11 a.m. April 4, 2019 from the Floyd Church of God, 1015 W. Chippewa River Rd., Midland. His family will receive friends at the church on Thursday from 10 a.m. until the time of services. Those planning an expression of sympathy may wish to consider Dusty’s family. To plant a tree in memory of Gerald “Dusty” Thomas Taylor, please visit our Tribute Store. "Email Address" would like to share the life celebration of Gerald “Dusty” Thomas Taylor. Click on the "link" to go to share a favorite memory or leave a condolence message for the family.